I was having a talk with my good buddy Marc during the Giants game today, when he asked a very interesting question: Can the NFL please stop trying to make London football happen? First of all, the NFL does London with the enthusiasm of a Boston College student doing the community service he was forced to do that one time he was caught drinking on campus while under the legal drinking age… or so I imagine. Anyway, as I watched my Giants win a tough game against the Rams, I legitimately couldn’t tell the difference between this game and any other Giants game I have watched this year, or any other year. The broadcast team was the same as it always is, with Kevin Harlan and Dan Fouts calling all the plays. While they made it a point to discuss the history of Twickenham Stadium from time to time, and took several moments to make typical American tourist jokes about good “pitch position” (cuz in England, them fellers call the field “the pitch!”) and other “lol, we’re in a different country and ignorant to their culture”-type humor, the presentation of this game was exactly the same as every other CBS/NFL Network game I have ever seen. Even the broadcast graphics were exactly the same as they always are. Want to know how to do this right? Take a look at WWE. When Vince McMahon runs WWE shows in London, you better believe you’ll know you’re in London the entire time. Sometimes, WWE goes over the top with it, putting old timey British cars on the entrance ramp and hanging Union Jacks from wherever they can in whatever building they’re in, and nary a WWE logo goes anywhere without incorporating something British on it. It’s damn near patronizing, but at least it’s an effort to sell the audience on the treat they’re getting by watching a WWE show in another country. Not only that, it helps the British fans see that Vince and the WWE really care about them, which helps the brand grow stronger. The NFL does none of this. Would it kill them to have some kind of British theme to the broadcast? Why not get a British announcer in the booth along with Harlan and Michaels? All he has to do is have some kind of rapport with the American guys, and talk a little bit about how American football has caught on in England. How about a British sideline reporter (no need to replace Stacey Dales, just have a second person to go to from time to time). 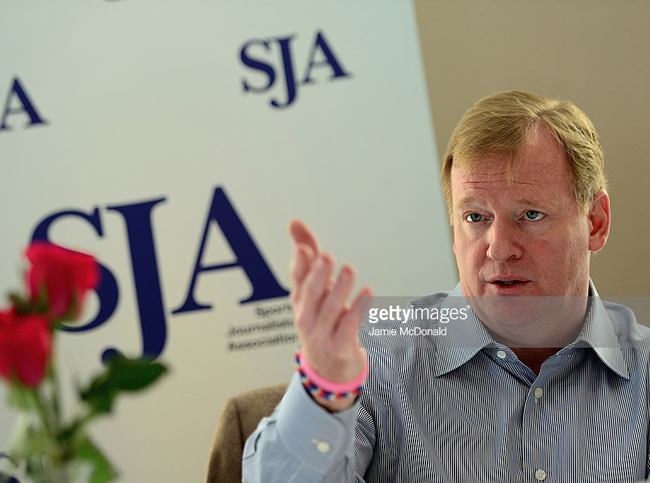 He or she could sell the global aspect of the NFL brand, and make us think… “Hey! This guy/woman sure talks funny, but he/she is fun! Maybe football in England isn’t awful! Not on Roger Goodell’s watch. You better shut your mouth, son. Hell, the NFL can’t even pick a good matchup for this. Sure, the Giants are one of the most historic franchises in the league, and New York is the most famous city in the United States, but does anyone in England want to see the Rams? Case Keenum isn’t exactly lighting up the jersey charts across the pond is he? Not only that, but as buddy Marc pointed out, they now play on the west coast. As a Giants fan, a 9:OOAM start time is inconvenient, but not crazy. If I’m a Rams fan, the game starts at 6:00AM. 6! In the morning! For football! Who the hell’s gonna do that? We couldn’t give them Patriots vs. Steelers or Chargers vs Falcons? Instead, they got the Giants and the Rams. Two offensive TDs and five turnovers. There you go, London. Look. We all enter multi-billion dollar contracts we immediately regret but have to comply with now and again. If I had a dollar for every time I did it, I’d have enough dollars to go back in time and buy my way out of that illegal drinking community service I had to do in college. But, I don’t, so you know what I remember? Even though I was forced to do it, I ended up having fun that day. I met some kids my age who were in town from Pepperdine University in California, and I ended up going to a Celtics game with them the next night. Why can’t the NFL make their chores fun too? It’d be better for the league, for the teams and players involved and a hell of a lot better for the fans. If they’re just going to present the exact same product we can watch at any time, then they need to just stop, or at least not schedule three different games there in one season. Why have games in London just to pretend we’re not having games in London? Do it right, or don’t do it at all, Roger. Maybe stay home and work on all those embarrassing domestic violence coverups.